Enkay's Mounted Facer Buffs are designed to help get into hard to reach areas that might not be accessible with standard buffing wheels. The cup base is designed to push the face of the buff forward providing a narrow but flat buff surface to polish with. The facer buff is mounted inside a plastic base to prevent scratching the metal surfaces around it. Similar to the mushroom buffs except these have a flat face. 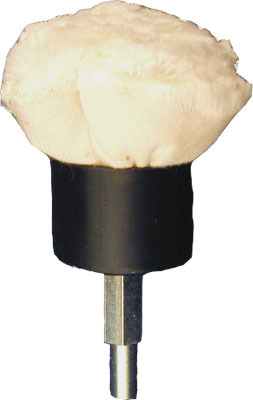 All of Enkay's 1/4" mounted buffing wheels are for use with any standard electric drill. Mounted Facer Buffs should not exceed 10,000 RPM. All Enkay Buffing Wheels must be used with polishing compound.